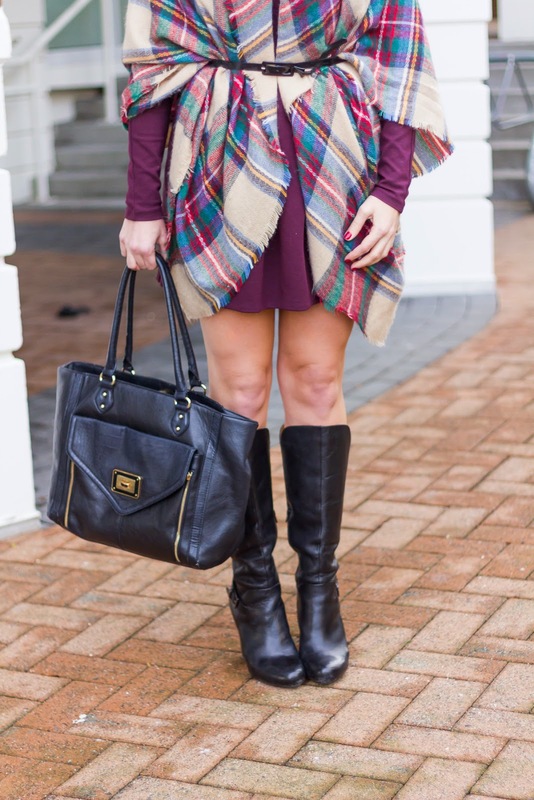 I have re-created this outfit every fall for the past 2 years – it never goes out of style! By now you are likely (well) aware of how to tie / style a blanket scarf. When blanket scarves became popular two years ago it seems that fashionistas everywhere had tutorials on how to tie them. While I am still a huge fan of the ‘traditional’ way of wearing them (I wear this plaid one all the time with a long sleeve striped shirt), styling a blanket scarf over a dress like I have done here is a more creative way to wear a blanket scarf. To get this look I simply unfold the blanket scarf to it’s full size, wrap it around my shoulders, and then tie a belt around the whole thing (so that you still have some shape!) Pair it with boots and you’ve got a fall ready look that is cozy, comfortable and right-on trend. I have a soft spot for dresses, so wearing a blanket scarf with a dress is an easy way to transition my dresses into the cooler fall weather. This plaid blanket scarf is definitely my most frequently worn scarf, but I have a number of others that I will also style this way. My second favorite is probably my green and navy plaid over a black long sleeve dress. In case you want some more ways to recreate this look, below I’ve included two widgets: one for my favorite blanket scarves, and one for comfortable long sleeve dresses that would be great to wear with blanket scarves. Happy shopping! "#GirlBoss | Interview with Tania (Jewelry Boutique Owner)"
Love this idea! Looks super cozy too! So glad you like it!! Thanks for stopping by girl!